Over our first weekend, Sister Diane and I were on the 2-10 pm shift. The first night they sent us home by 9:15 or so and I was glad, wimp that I am. My feet and legs were killing me! I loved being with the families however, and my broken Spanish wasn’t too bad though I was glad not to be asked right away to do intake. Sister Diane and I handed out sheets and towels, toothpaste, razors, etc… whatever personal needs people asked for. Many were dads with children. They wear an ankle bracelet (tracking monitor) and must report to immigration at the next place they go. Some will go to New York, Boston, Houston, Indiana, New Jersey—wherever they have relatives or friends who will pay bus or plane fare. Folks are moved out the next day as much as possible, because so many come every day. These Dads and Moms and children have been through so much and we are humbled by their gratitude for the little we can do. There is nothing to be afraid of here. About 120-150 people stood in line for dinner which was served and prepared by a church group. Sister Diane also worked on replenishing food when what had been prepared ran out. Look for someone to relay messages regarding a change of departure time. There is a site supervisor who directs more or less what to do. Sometimes we now can figure out what to do. Several Presentation Sisters arrived recently. Last night a married couple stayed until 9:30 just because Brother needed extra help onsite. Most El Paso volunteers have been bilingual. We feel so lucky to be here. Thank you to our Associates, Plaza Grey Nuns, and Staff who donated so much to this project. We have purchased so far about $650 worth of paper goods, fruit, and snacks at Sam’s and Costco’s. Have I mentioned that we ask the guests to help cook, clean up, sweep, mop etc.. and the men and women eagerly assist. Oh, how I wish those who are taken in by the rhetoric about these “dangerous” people could be here with us to see who they really are. I write this in tears because it is so moving to serve fathers with children as little as 2 and mothers with babies and little ones — all trying to get to cousins, uncles, brothers, sons — to be safe from the violence and the poverty they are escaping. Today Sister Diane was off duty, but she came over anyway and helped out here and there. She is wonderful with children (of course!) and can dramatize to make up for not knowing Spanish. She is also, as you know, tireless! I was on the 10-6 shift with a variety of duties and some standing around. Sr. Diane and Sr. Pat Ginty (another volunteer) got a ride with Sr. Buffy to see another shelter run by Annunciation House, the Oscar Romero Center. They also drove with Sr. Buffy to a portion of the wall. Diane may have photos—not sure. This evening several Presentation sisters, a Daughter of Charity, and others got together for wine and pizza. This was a treat of a friend of Sr. Buffy. She had given us the money about a week ago. It was great to get together. We are usually ships passing in the night because of different site and shift assignments. Sr. Diane is overnight tonight—that is 10 pm til 7 am. She can sleep in the room with the med supply closet, if she can grab a moment to nap. She’ll have the day off tomorrow (Saturday). I’m on from 2 pm until 10 pm. The rumor is that we will stop receiving guests here at Casa Nazareth as of Wednesday, March 27. No official word, yet. Loretto Nazareth Senior Care, which occupies half of the building we’re in, plans to repossess the half on loan to Annunciation House, and we’re to be out by April 1st. Casa Nazareth has been in this space for the past 4 years. We have no idea what this will mean. I’m sure negotiations have been going on for some time. Maybe we’ll help in the move to another site; maybe we’ll be assigned to one of the other thirteen shelters. We’ll see. Annunciation House runs 13 shelters for those coming across the border, being detained by ICE and then released. Casa Nazareth is one of the shelters. More later. Yesterday (March 24) I (Sr. Eileen) had overnight duty. I went over around 7 pm and did some odd jobs. Then I made calls to volunteers looking for drivers to take people this morning to the bus or airport. It’s inspiring to learn how many women and men do this on a regular basis. They don’t just drop them off; they go into the airport or terminal and help them navigate the system. They have a bag of snacks and sandwiches for the journey. Some may travel from here to Virginia or Maryland or New York so they have a 3 day journey if they’re going by bus. If by plane, they may have one or two stops and they have a paper in English attached to their sandwich bag that asks ‘Can you help me find my plane connection?’ I pray some good Samaritans abound on their way! I prepared some travel bags, gave out some meds, distributed some sweaters, and tried to be useful rather than in the way. Around midnight I lay down in the clinic room and slept off and on. At 5:30 am truck deliveries for the nursing home started and I kept praying that Border Patrol would not show up with new migrants. They did not. I gave penicillin to a little boy who’s being treated for strep throat,every 8 hours. Nursing home staff starts rolling down to their kitchen by 6 am. I was relieved at 7 am. It felt good to be in my own bed, after coffee and changing into pjs, to sleep for a couple of hours. Sister Diane’s shift is 2 pm-10 pm, but she went over early to see if they needed her. As her Sister Grey Nuns know, she is the energizer bunny! Then there’s Eileen—the tortoise in the race. At Casa Nazareth, Sr. Diane and I finally know how to do many tasks and my Spanish has gotten pretty good, and we are leaving in two days! Our supervisor Crista says that’s how it is always. They are used to it. Today and yesterday we spent some time packing up blankets, sorting through children’s books and toys, helping serve meals to brand new and one day old “guests,” giving out meds or explaining that we don’t have that, showing families how to get cold water out of a shower that no longer functions properly. I did some intake and a few phone calls to sponsors who are to purchase bus or plane tickets for their friends or relatives. There were more complete families these two days, mom and dad with children. Oh! Such beautiful people with smiles just for one kind word or a little self deprecating humor. Tonight Sr. Diane was able to come up with bread, rice, salad, and leftover chicken for a crowd of 37 that border patrol brought us around 8:00 pm. They come exhausted, hungry, with colds, coughs, flu, and you name it and we try to “be the compassion of Christ” for them for one day along side other Sisters, Brothers, wives and husbands and volunteers of every kind. Some come and do all the laundry weekly; some prepare dinner or lunch once a month; some drive people to bus terminals and the airport; some, like us, work for two weeks or one month at whatever is needed. Here staying at El Convento are Presentation Sisters, Sisters of St Joseph, Daughters of Charity, Dominicans, Sisters of St. Agnes, several Associates, other laywomen—from all over! I am beat but so happy to have been able to be here. Thank you all Grey Nuns, Associates and partners/staff who make St Marguerite present in El Paso! So glad to be able to do this because we are Grey Nuns of the Sacred Heart! On April 10 Marty Moss-Coane of WHYY’s Radio Times had an excellent interview with Jeff Faux, founder and distinguished fellow at the Economic Policy Institute (click name to learn more about EPI). 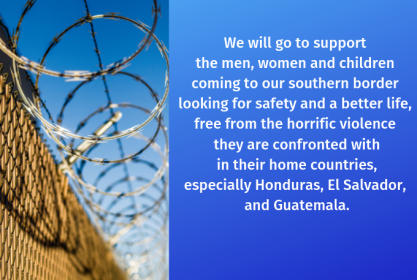 During the interview, Jeff talks about the history of U.S. intervention in Latin America, and how it has contributed to the conditions that cause so many to flee their homes for asylum in America. While the entire 49 minute podcast is worthwhile, the second half is the portion that is most directly related to the current (Spring 2019) influx of refugees at our southern border. Click here to listen. I remember both sisters from happy days at Melrose Academy grade school. The work you are doing is so special. Thank you. I add my thanks to both of you for ministering to Christ present in the refugees. I’m so grateful to you for assisting these needy persons who have lost almost all that was familiar and dear. I pray for your strength, perseverance, and wisdom to know what each one might need from you. Love and a big hug! I AM SO GLAD THAT YOU ARE MEETING AND GETTING TO SEE THESE WONDERFUL PEOPLE. I REALLY BELIEVE THAT YOU ARE SEEING THE BODY OF CHRIST.. I LOVE YOU BOTH AND I AM SO HAPPY TO CALL YOU MY SISTERS. MOTHER D’YOUVILLE MUST BE SO PROUD OF YOU, I KNOW I AM. We are so proud of both of you and grateful for the heartfelt insight. We pray daily for you and the other workers as well as for our immigrant sisters and brothers. God bless all of you.